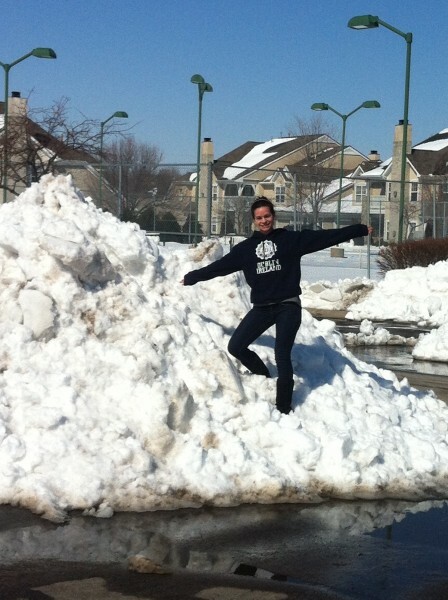 This is what happens when it snows in Kansas. It snowed for only a few hours, but it with the “thundersnow” it came down at the rate of 2 inches/hour. I took this picture today (sunday), it snowed Thursday. The sun has been out the last two days to help melt it, which means this pile was much larger. And it is still taller than I am. AND, this is just a pile from one small parking area that fits about 10 cars. We had about 11″ of snow. And the best part. We have another 8-15″ coming tomorrow afternoon. Yay us. It looks like more hoodie/ugg days for me. I saw this on pinterest and it’s so true. I love books. They’re exactly perfect when you need a quick escape from reality. Writers are magicians who can make us forget about our lives for just one minute. Long enough so that when you come back, you have a bit of perspective on your hands. Everywhere I go, online or in-store, I see skater skirts. To be honest: I love it, too! They’re so cute and simple yet fabulous. They’re extremely flattering and can easily be dressed up or down. Pair them with a button down blouse for work or throw on a sweatshirt for the weekend. Heels, booties, or flats, they will work with everything. This past week I was browsing through some magazines and just a few pages in, I came across an ad that needless to say took me by surprise. While we all knew that the new head of Yves Saint Laurent was going to be changing the brand to “Saint Laurent Paris” to go back to its original, it still didn’t seem quite real until you see the first ad. Without the “Yves” and the typical letter style logo, it’s different. I realize that is the point. Hedi Slimane, the new creative head, is hoping to go after the younger, more modern crowd, and that’s great, but was it really necessary? Did you find that the original Yves Saint Laurent line was too old for you? To me it wasn’t old, it was classic. I put it on the same shelf with Chanel, Dior, Louis Vuitton, Fendi etc. who have no age requirement. What’s your thoughts on the new branding? I, like most fashionistas, headed to their local Target to grab a few goodies from the Prabal Gurung “Love” collection before it got ripped off the shelves. I mentioned in my last post on it that I was interested to see if it would be more like the Missoni line or the Neiman Marcus collection and I found that it was right in the middle. Some items went very quickly off the shelves and online while others are still available and probably will be for some time. I bought 4 items of the collection. And here’s where the good and the bad comes in. They had my favorite dress at my local target so I was able to get my hands on it; however, my target had about 4 pairs of shoes, 3 clutches and absolutely ZERO jewelry. I really wanted the multicolored lace-up heels but all they had was black and they looked a bit cheap. So, a bit defeated, I tried on the items I grabbed and walked out of Target a bit sadder than I went in. Items were available online, but by the time I left Target and looked on Target’s website, the shoes I wanted were gone. 1. Dress w/ Full Skirt in Floral Crush Print – $49.99. Here is where photoshopping, good lighting, and possibly a specially made dress for the lookbook magic comes in. This dress looks amazing in the lookbook. Truly amazing. When you see it up-close however, it is just a colorful print on stiff white fabric. It looks great with a leather jacket over it but it definitely cannot be worn by itself with the print. 2. Shorts in Floral Crush Print – $26.99. These, I admit, were an impulse buy. They fit, and I figured I could wear them now with black tights or in the summer with a white shirt and maybe pink blazer? I don’t know yet but I honestly hadn’t even considered buying these until I saw the collection up close. This image makes them look sort of long on the leg, but they are in fact not long at all. 3. Short-Sleeve Dress in First Date Print – $39.99. Out of the clothing that I purchased this is my favorite piece. It still doesn’t quite look expensive, nor extraordinary quality, but it is cute. and with heels and a belt, it’s really cute, a bit long for my taste, but I’m also only 5’2″ so I understand why. It’s silky and lightweight and fits really well. 4. Lace-up Pump – Meet the Parents Print – $39.99. My absolute favorite item and I was so glad to see that my Target at least had these even if it didn’t have the multicolored strappy lace-up heels. These are honestly gorgeous and comfortable. They zip in the back so if you have narrow feet like I do, no lacing is required. The soles have rubber on them so you won’t slide. I really hope these hold up for a long time! The other items in the collection, the ones I didn’t buy were simply because they were extremely plain. The color-blocked cardigan and skirt, plain yellow sweater, and racerback tanks look like they could’ve come from anywhere. They could’ve easily been placed on a different rack in Target and no one would’ve noticed them. Even though I’m not a jewelry hoarder, I wish my Target would have had at least one piece of jewelry to just look at. That’s the thing about living in Kansas: items might still be on the shelf tomorrow, but because of that, we don’t get the whole collection. Summary: My honest opinion, the only thing really worth the price was the shoes. Everything else, especially the dress with the full skirt in floral crush print, was a letdown. But, I realize I can’t expect perfection. It’s a designer making clothes available for Target. I did just hope for a little bit more. What are your thoughts on the collection now that you’ve had a chance to see it? Sometimes when you’re browsing through the countless catalogs you receive in the mail you think to yourself, “yeah, no one would seriously ever wear that” and then there are other times that you see an outfit and instantly start drooling which makes your wallet cringe. I love looking through catalogs simply for inspiration on how to reuse my current wardrobe though, I will admit, I do tend to add a few pieces upon browsing catalogs. I’m a shopaholic, so what? Recently I came across these outfits and am in love. They make me wish for spring! With a new job just around the corner, I love thinking of new outfit ideas perfect for work and catalogs are always helpful for me. That’s right, the day has finally come for those who have waited. The anticipated Prabal Gurung “Love” collection is arriving at Target in just a matter of hours that will last through March 23, 2013, while supplies last. Prices are: $19.99 to $199.99 for apparel and $12.99 to $39.99 for jewelry, handbags and shoes for the 80 piece collection. Here’s just a few of the outfits from the lookbook. You can see how colorful the collection is. All photos courtesy of Target. I’m very curious to see if this collection is going to be a smash like the Missoni and Jason Wu or if it’s going to be more like the bust that was the Neiman Marcus collaboration. Missoni sold out in hours whereas the Neiman Marcus collection ended up on clearance for 75% off. What piece are you most excited for?